Q: Hot, humid and not exactly straightforward; talk us through your weekend in Singapore. KR: I think we had the chance to do a bit better as the car felt good on Sunday. Not being able to qualify higher on Saturday hurt our chances, then it was a boring race in the car as it’s very difficult to overtake there. The first safety car was not very good for us, but the second one was better for our strategy. I followed Michael [Schumacher] for most of the race, and it was quite frustrating as our car was faster. It’s not very good when you’re stuck behind people as it degrades your tyres and reduces the grip, but it’s a case of just doing the best you can and then trying to jump others during a pitstop or hoping they make a mistake. Q: You’re still third in the Drivers’ Championship; can you go higher? KR: You try to do the best you can. This year has been good for the team and we’re doing well in the Championship so I’m happy with where we are and think that we have a good chance to improve. Of course the objective is always to try to win races and to bring home as many points as possible. Q: People are asking if you could take the Driver Championship title without winning a race; do you think that’s possible? KR: I think it’s very difficult to say. There are too many things that could happen over the next few races. I guess if you look at it mathematically then yes, I could, but personally I feel you have to win at least one race to make sure you are World Champion. There would have to be some big dramas if I were to take it from Fernando [Alonso] or Sebastian [Vettel] without winning a race, so all I can do is keep moving forward and trying to win. That’s all I set out to do anyway, every time I step into the car. Q: Tell us about Suzuka? You famously won there in 2005; is it a circuit you enjoy? KR: It’s a good circuit, one that’s quite fast and there are some nice opportunities for overtaking. The best tracks for me are ones with long straights and sharp corners with lots of space for racing on, and Suzuka has that. In 2005 I had one of my best wins there after starting the race near the back of the grid and then taking the lead on the last lap. Winning in that way, you never forget the feeling it gives you while crossing the finish line. Q: How difficult is Suzuka to master? KR: It is one of the more difficult tracks and part of racing at Suzuka is that there are usually quite a few accidents. When you are on the limit, a driver will always have some big moments during the weekend at a fast circuit and Suzuka really punishes the driver due to the speed of the track and the small run-off areas. It’s a great circuit; very quick and challenging for both car and driver. You need an aerodynamically strong car there, and a solid car to go through those fast, long sweeping corners. I think that suits the E20. Q: There have been a few difficult races for the team, how tough is the championship battle? KR: We should get some new parts and setting up the car the way I like it to be depends on the weather and on the circuit. We know the speed is there in our car, we just have to find the right set-up to maximise it every time. We give it our best shot to be on the podium, but the races are going to get more and more difficult with other teams constantly pushing with new development parts. Obviously, we have to make a step forward from Singapore – where we were nowhere – to be fighting for top places. It’s impossible to predict how our car will go in the next races. We have to wait until Friday practice to decide how to approach the race. Q: How do you cope with the many Japanese fans and screaming girls bearing gifts? KR: It’s part of being a Formula 1 driver and it shows how enthusiastic the fans are. There are very many fans and they seem to be able to find you wherever you are. They can run fast but I don’t think they will catch me when I’m in the car. yes, unless Massa leaves Mafiararri. 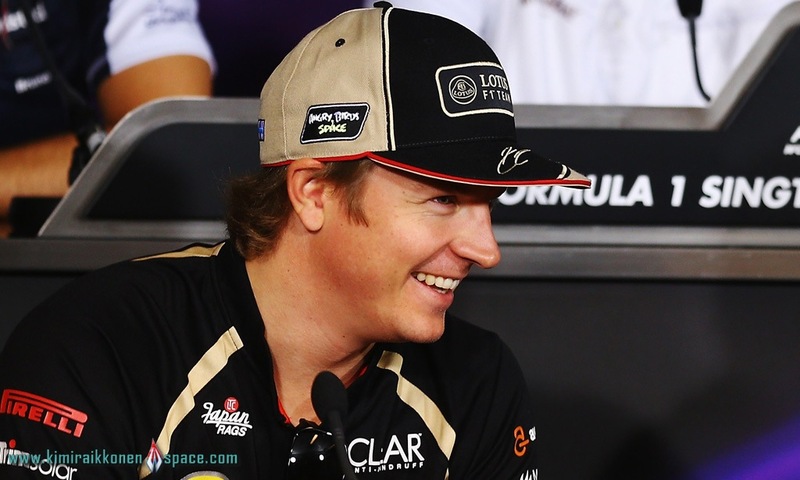 But highly unlikely Kimi will go there. Too much bad blood with Luca and the other hoods there. But then again, stranger things have happened in F1 history…. Red Bull in 2014 together with Vettel. I bet Red Bull got wet dreams about Kimi after seeing him in their colors in Rally. Kimi = Red Bull brand. Loves to see Kimi in McLaren but I dont see it happening very soon as Kimi currently loves being in Lotus..
screaming girls..?? rock star status..? Jenni won’t be happy at all..!! !